Ballinamallard  (from Irish Béal Átha na Mallacht, meaning 'ford-mouth of the curses') is a small village and townland in County Fermanagh, Northern Ireland. It had a population of 1,340 people in the 2001 Census. 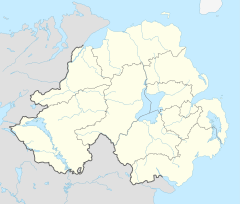 It lies to the north of Enniskillen and is situated within Fermanagh and Omagh district. The village has won several "best kept village" titles, and has a fountain to mark the honour. There has been only one local primary school: Ballinamallard Controlled Primary School, since the other, Shanmullagh Primary School, closed in August 2008. About 450AD Magheracross said to have been founded by St Patrick and about 550 St Columba passed thorough Ballinamallard. The first records of the parish itself were in 1492 with Terence Macgillacossgli (Cosgrave) is recorded as vicar of Magheracross and Derrybrusk, Maghercross was at that time part of Derryvullen parish. 1593 saw the start of Hugh O'Neill's war that resulted in the Flight of the Earls in 1611. Following which Henry Folliot of Pyrton in Wiltshire, was granted the Manor of Drumchine (later Newporton) including 1,500 Irish acres through Magheracross parish. He built Castle Murray and imported tenants from the Scottish Borders between Dumfries and Carlisle who were fleeing the union of England and Scotland and the consequent pacification of the previously lawless area around Anglo-Scottish border under James I that was taking place at that time. By 1622 there were 20 houses in Ballinamallard and the Church "standing but not repaired within". In 1629 the old graveyard at Kilskeery and Magheracross was officially united with Kilskeery parish. Religion was important through the 18th century. In 1704, Rev N Browne, Rector of Kilskeery, translated the Prayer Book into Irish. In 1766 Magheracross Parish split from Kilskeery and in 1769 John Wesley visited the area bringing Methodism. Coa Chapel was built in 1770. Ballinamallard Church of Ireland was built in 1785 and the Methodist Hall was constructed in 1800. The Present Church of Ireland was built in 1844. The 18th century also saw non-religious developments, Magheracross House was built in 1740 and the Ballinamallard bridge was built in 1750. 1783 saw the Repeal of Poyning's Law and the Birth of Orange Peggy. In the early 20th century, thousands of Cooneyites or "Dippers", followers of Edward Cooney and William Irvine, flocked to religious conventions at Crocknacrieve House near Ballinamallard. Converts were baptised by immersing them in Lough Erne or tributary rivers, events which attracted large crowds and international attention. Many family businesses are located in Ballinamallard. In the 1970s the Development Association initiated some useful projects. The old Great Northern Railway station was restored to become the Rascal’s PlayStation, a purpose-built child care centre, while the Commons was transformed into a children’s playground and industrial units were established on the Enniskillen road. Ballinamallard’s best known family are the Fishers, whose firm, Fisher Engineering, has brought substantial employment to the village. The company, which specialises in agricultural engineering and building construction, was founded by the late Thomas Fisher when he returned from World War II. Today Fishers are one of the foremost steel construction firms in the British Isles servicing such projects as the Waterfront Hall and the Odyssey Arena, both in Belfast. Ballinamallard railway station opened on 19 August 1854, but was finally closed on 1 October 1957. The village is the home of Ballinamallard United, which plays in the IFA Premiership and Fermanagh Mallards F.C.. Roy Carroll, a former Manchester United goalkeeper, used to play for Ballinamallard United. The area is particularly noted for its trout fishing, with Erne tributaries flowing through and around the village. Sir Edward Poynter married, Agnes, another of the MacDonald sisters so he also had roots in the village. Michael Jackson, the current Church of Ireland Archbishop of Dublin and Glendalough, lived in Ballinamallard in his youth. Archbishop Jackson previously served as Church of Ireland Lord Bishop of Clogher. 3.2% of people aged 16–74 were unemployed. 99.27% were from the white (including Irish Traveller) ethnic group; 21.69% belong to or were brought up in the Catholic religion and 75.17% belong to or were brought up in a 'Protestant and Other Christian (including Christian related)' religion; and 66.13% indicated that they had a British national identity, 14.11% had an Irish national identity and 29.16% had a Northern Irish national identity*. 5.21% had some knowledge of Irish; 5.97% had some knowledge of Ulster-Scots; and 1.37% did not have English as their first language. ^ "The Pilgrim Tramps. The Rite of Baptism. Immersion of 27 Followers in the Ballinamallard River" The Impartial Reporter and Farmers Journal, Enniskillin, Northern Ireland. 29 September 1904, p. 8. ^ "Crowds Await Millennium. Cooneyites Hold Prayer Meetings and Baptize Hundreds Daily in Ireland" The New York Times, New York, New York. 4 August 1909, p. 3. ^ "Ballinamallard station" (PDF). Railscot – Irish Railways. Archived (PDF) from the original on 26 September 2007. Retrieved 2007-09-09. This page was last edited on 5 August 2018, at 16:44 (UTC).